The physiological responses of nine commonly planted North-American hybrid poplars to drought was evaluated, resulting in a ranking of drought resistance. Indicator genes for drought response processes were scored for differences in expression levels in the most sensitive and resistant clones, confirming levels of drought stress and differences consistent with roles in drought resistance. Poplar hybrids are cultivated in North America for environmental applications, agroforestry, and the pulp and paper industry primarily because of their fast growth and limited nutrient requirement. For the same reasons, they have been identified as suitable species for carbon sequestration and as a potential feedstock for carbon–neutral production of energy. The clones deployed on the Canadian prairies are generally regarded as drought sensitive, which poses a problem as water availability has steadily decreased in this region over the past century and a severe water crisis has been predicted. 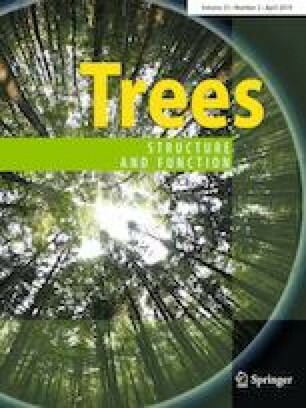 To approach this problem, we tested nine commonly deployed North-American hybrid poplars, developed for large-scale cultivation in the Canadian prairies, for their physiological responses to drought, resulting in a ranking of drought resistance. The difference between the clones showing the most and the least response of drought stress was large, and we used these clones to further examine the differences in the expression of genes known to be up-regulated in response to drought stress. This interrogation showed significant differences in transcript abundance that largely reflected the physiological status of the tested clones, but also many genes being down rather than up-regulated in response to drought stress in the drought-tolerant clone. In particular, putative positive and negative regulators of abscisic acid signaling were expressed at levels consistent with a potential role in observed differences in drought resistance. The online version of this article ( https://doi.org/10.1007/s00468-019-01846-1) contains supplementary material, which is available to authorized users. We thank Alberta-Pacific Forest Industries Inc., Alberta, Canada, for providing several hybrid poplar clones and NRC-Plant Biotechnology Institute, Saskatchewan, Canada, for ABA quantifications. Funded by a Natural Sciences and Engineering Research Council of Canada (NSERC; http://www.nserc-crsng.gc.ca/index_eng.asp) Strategic Projects Grant (STPGP 337209-2006) awarded to AP, MC and SDM and by an NSERC discovery grant (RGPIN/05998-2014) to JM. The funders had no role in study design, data collection and analysis, decision to publish, or preparation of the manuscript. We thank the reviewers of this manuscript for their constructive comments. AP and JM designed the study, AP, JM and SB supervised and MA and KB carried out the experiments. WRS and BRT provided poplar hybrids. MA and JM analysed the data, JM and MA wrote the manuscript and all authors provided feedback on the manuscript.